Bring some awesome interactive games to your event! Give your guests the chance to play some intense laser tag or battle each other in blitz ball. Using the latest in laser gun technology, our mobile laser tag is guaranteed to wow your crowd. We can transform any area into an ultimate laser tag battlefield inside or outside. Haunted and glow laser tag is also available. Blitz Ball is by far the most intense interactive game in the Midwest. Armed with special foam blasters and protective gear, two teams battle to high-energy music, trying not to be hit and taken out of the game. Bow and arrow tag is a phenomenal new concept in friendly combat sports. Played inside or out, the game utilizes archery equipment with special foam-tipped arrows to play the game. Virtually painless, bow and arrow tag is intense enough for the thrill seeker while being safe enough for kids. Try and sink putts like a pro with our new black light putt-putt golf. 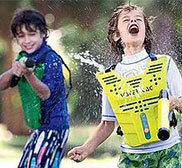 Using special water vests, players use water guns to try and fill their opponent's vest before their own vest is filled up. Take aim at this exciting competition! 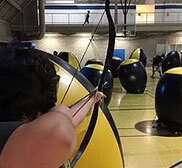 Challenge your friends to a game of skill by using bows and arrows. Be the first to victory by knocking down all the targets first. 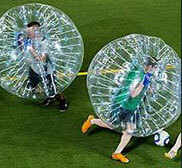 Bubble soccer takes the experience of traditional soccer and catapults it into rip-roaring laughter, exhilarating knocks, and rolls that will keep you coming back for more. Glow volleyball is perfect during homecoming week. You supply the nets and people — we supply the rest. Glow basketball and glow dodgeball is also available. Our iceless skating rink is an attraction that will wow your crowd! 32' wide and 40' long, it's big enough for up to 30 people to skate at once. We have a large selection of skates, from kids all the way up to adults. Inside or outside, this attraction is sure to impress. "Look Mom, I'm on TV!" Let us make you a star while you perform in costumes alongside your favorite artists. Each performer walks away with their own DVD. Experience the latest in green screen technology, with photos ranging in size from 2x3" all the way up to 6x8" photos. What's more, they can be customized with any background. Pictures can be put in frames, snow globes, key chains, mugs, and more! This attraction is a great addition to any event. Discover an entertaining way to make casts of your hands in almost any position. These make for a great novelty to take home. Test your racing skills in the NASCAR simulator. Full motion scale cars make it feel like you are taking on the huge banked turns of Daytona! Or, try our DUI simulator in order to experience and understand the effects of impaired driving. Guests can choose from hundreds of colorful designs that can be done in minutes. 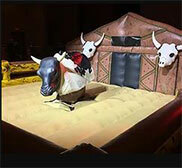 We can incorporate your logo or school mascot to fit any event. Our high-quality alcohol-based paints last on average 4-7 days, and we use only safe FDA-approved non-toxic paints. Airbrush face designs are also available. This attraction will literally make your crowd laugh out loud. The dunk tank can be filled with water or colored balls. Get the principal or boss into the dunk tank for a little revenge! Wow your crowd or audience with a giant blast of multi-colored confetti! A wide range of colors is available. Check out our high-tech computer generated lasers and wow your crowd. 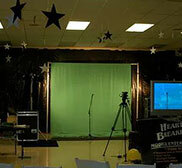 Use black drape to add a professional look and cover up unsightly areas of a venue. A spandex-like material, scrims are perfect for bouncing light and adding character to backdrops. A white backdrop, this is used to reflect light and add elegance to any event. Add elegance to your event with our brand-new white dance floor! Water-based haze and fog add a great effect to almost any event. Add an elegant look to your convention or get-together. 10" and 15" screens are available. Decorative LED lighting placed around your venue will truly help your theme stand out. They are available in any color! Vertical trussing adds a great look to your event. With LED lighting shining up through them, you'll add a touch of color to your event.